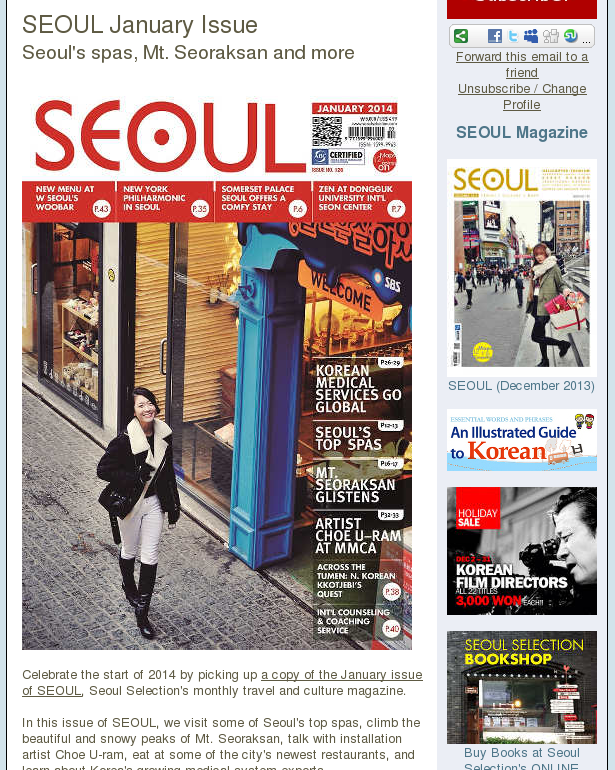 Celebrate the start of 2014 by picking up a copy of the January issue of SEOUL, Seoul Selection’s monthly travel and culture magazine. 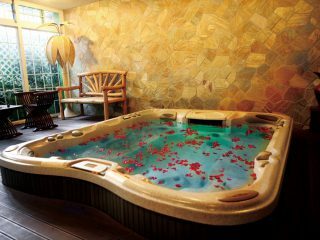 In this issue of SEOUL, we visit some of Seoul’s top spas, climb the beautiful and snowy peaks of Mt. Seoraksan, talk with installation artist Choe U-ram, eat at some of the city’s newest restaurants, and learn about Korea’s growing medical system exports. And if that isn’t enough, there’s always our Goings On Around Town, one of the best roundups of the month’s concerts, exhibitions and festivals anywhere. You can find SEOUL at a major bookstore near you. Itaewon French bistro Le Saint-Ex celebrates its 13th anniversary with a special Christmas menu (Dinner: Dec 24, 25–31 & Jan 1, KRW 85,000/Lunch: Dec 24, 25–31 & Jan 1, a la carte). There’s a takeout menu on Dec 24–31, too. See here for more info, including menu specifics. – Korea’s cultural heritage, in coin form. – Will Korea’s startup culture rival Silicon Valley? – Meet Latin America’s K-pop fans. – Sunrises and crabs at Ganggu Port, Yeongdeok. – Yes, I suppose some English-language slogans could use some more thought. 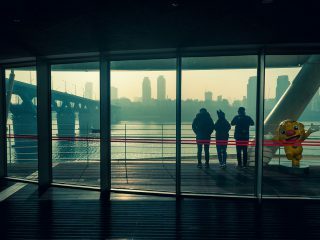 – Sunrise at the port of Gangyang, Ulsan. – The Lotte Department Store, lit up and at night. – Steve does instant yukgaejang. – The islands Oryukdo provide one of the most beautiful sunrises you’ll see in Busan. – Beautiful snowflowers atop Mt. Deogyusan. The 2014 New Year Festival will be held in Busan to celebrate the first sunrise of the year after bidding farewell to 2013. On New Year’s Eve, throngs of citizens are expected to turn out to ring in a new year at Yongdusan Park. There will be an array of artistic and festive events, while people can watch the first sunrise from this panoramic vantage point in downtown Busan. Major beach locations will host a number of festive events to greet the new year as well. GETTING THERE: It takes three hours to get from Seoul to Busan by KTX. Every New Year, sunrise gazers throughout Korea descend on the East Coast town of Jeongdongjin to take in the inspiring sunrises and pray for a healthy and happy year ahead. It is also home to the world’s closest train station to the sea—Jeongdongjin Station is, quite literally, on the beach. The most charming spot consists of a couple of wind-swept pines and a simple bench not far from the station itself, a reminder of the peaceful, forlorn Jeongdongjin of old. GETTING THERE: The night train to Jeongdongjin departs from Seoul’s Cheongnyangni Station at 11:15pm and arrives at 4.26am. Winter might not seem like the best time to visit a green tea plantation, but the famous green tea fields of Boseong play host to one of Korea’s most visually appealing winter festivals, the Boseong Grean Tea Plantation Light Festival. The undulating green tea fields are lit up with a variety of colorful light displays, adding to their already spectacular beauty. GETTING THERE: Take the KTX to Gwangju, and from Gwangju’s U Square Bus Terminal take a bus to Boseong. When in Korea are taking a trip to Jejudo over Christmas to escape from the big freeze in Seoul and enjoy the wonders of Korea’s answer to Hawaii. View of the Hangang River from Ttukseon’s J-Bug. Photo by Robert Koehler.